Parents with children due to go to secondary school later this year are to be told there are 180 more students wanting places than schools can take. 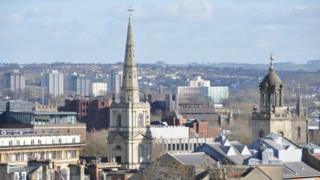 The report before Bristol City Council says projected demand is estimated to be about 4,300, with 4,120 places on offer by schools in the city. Pupils needing to change schools or moving to Bristol will find "very few" places available in Year 7, it added. The DfE said councils had to ensure there were enough places locally. A Department for Education (DfE) spokesperson said this year Bristol had received £252m for its schools and £51m in high-needs funding to support children with special educational needs. The Local Democracy Reporting Service says council must ask now existing secondary schools to admit more pupils in 2020 than planned "to ensure every pupil receives an offer". The council did not respond to questions about what power it had to make schools take extra pupils or the impact that would have on class sizes and teacher-to-pupil ratios. A city council spokesman said schools were asked to take more than their published admission numbers in 2019, which resulted in all children receiving an offer, 90% to one of their three preferred schools. "We recognise that expanding places by making offers over the agreed published admission numbers is a short-term solution to meeting this spike in demand and isn't a sustainable fix," the spokesman said. "It's likely we will need to do the same next year but in the long term the only sustainable solution will be to build more schools." Three new secondary schools are planned for the city but only one of them will open in time to take pupils next year.